Band-in-a-Box is an intelligent automatic accompaniment program. You can hear and play along to many song ideas and go from “nothing” to “something” in a very short period of time with Band-in-a-Box as your “on demand” backup band. Just type in the chords for any song using standard chord symbols (like C, Fm7 or C13b9), choose the style you’d like, and Band-in-a-Box does the rest. 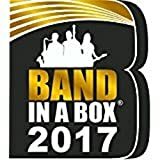 Band-in-a-Box automatically generates a complete professional quality arrangement of piano, bass, drums, guitar and strings in a wide variety of styles. This entry was posted in Software and tagged Band, MegaPAK by Computer Education World. Bookmark the permalink.